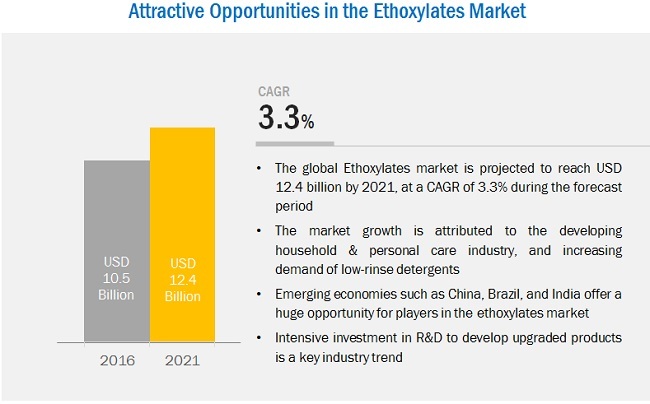 [138 Pages Report] The Ethoxylates Market was valued at USD 10.16 Billion in 2015 and is projected to reach USD 12.37 Billion by 2021, at a CAGR of 3.33% from 2016 to 2021. In this report, 2015 is considered the base year and the forecast period is from 2016 to 2021. 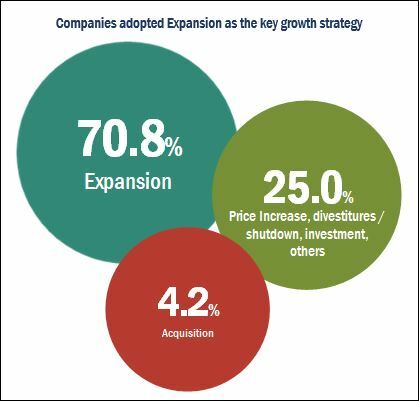 Note:* Core competencies of the companies are determined in terms of their key developments, SWOT analysis, and key strategies adopted by them to sustain their positions in the market. This research study involves the extensive use of secondary sources, directories, and databases (such as Hoovers, Bloomberg BusinessWeek, and Factiva), to identify and collect information useful for this technical, market-oriented, and commercial study of the global ethoxylates market. The primary sources mainly include several industry experts from core and related industries and preferred suppliers, manufacturers, distributors, service providers, and organizations related to all segments of the industry’s supply chain. After arriving at the total market size, the overall market has been split into several segments and subsegments. The figure below illustrates the breakdown of the primary interviews based on company type, designation, and region conducted during the research study. The ethoxylates value chain starts with raw materials such as crude oil, natural gas, palm kernel oil, and coconut oil. To manufacture petroleum-derived ethoxylates, the major raw materials used are crude oil and natural gas. The production process has intermediate products such as ethylene, olefins, and fatty alcohols. For the production of oleo-chemical-derived ethoxylates, common raw materials used are palm kernel oil, coconut oil, and tallow oil. The intermediate products produced in this process are fatty acids, methyl esters, and fatty alcohols. Petrochemical-based alcohol ethoxylates provide additional flexibility based on their carbon chain length varieties and branching. Petrochemical-based and oleo-chemical-based alcohol ethoxylates with similar structures exhibit similar biodegradability and toxicity. These ethoxylates are used in laundry detergents, institutional cleaners, shampoos, disinfectants, dishwashing detergents, and many more applications. The major manufacturers of ethoxylates are, BASF SE (Germany), Royal Dutch Shell Plc (Netherlands), Huntsman International LLC (U.S.), Stepan Company (U.S.), Clariant AG (Switzerland), The Dow Chemical Company (U.S.), Sasol Ltd (South Africa), India Glycols Ltd. (India), Ineos Group Ltd. (Switzerland), and Solvay (Belgium). Ethoxylates are then either sold directly to the end-users or to distributors. The major end-use industries of ethoxylates are household & personal care, pharmaceutical, agrochemicals, oilfield, and others. This report categorizes the ethoxylates market based on type, end-use industry, and region. China is the largest market in Asia-Pacific and one of the leading countries in terms of production as well as consumption of ethoxylates. It is the second largest economy in the world and is still growing at a rapid pace. It is making deliberate efforts to boost various industries including construction, agrochemicals, and oil & gas. Growing industrial activity, and shift in consumer’s lifestyle has resulted into rising demand for ethoxylates. Market participants are increasingly shifting their production to China from the U.S. and countries in Europe owing to the associated cost, labor, and transportation advantages. Asia-Pacific is projected to be the second-largest and the fastest-growing ethoxylates market through 2021 due to increased investment in the manufacturing sector and the presence of booming economies such as China and India. Asia-Pacific is expected to overtake Europe, as the largest ethoxylates market in the next two to three years. The demand for ethoxylates in the pharmaceutical industry is projected to register the highest CAGR during the forecast period. The positive economic growth, and flourishing healthcare industry in the Asia-Pacific region is expected to drive the demand for ethoxylates in this industry. There are many end-use industries of ethoxylates in the US, which are growing such as household & personal care, pharmaceutical, and oil & gas. The country is highly focusing on healthcare, and household & personal care industries and launched various programs for the same. The major manufacturers in the region are focusing on R&D for advancements in technology to provide customized products. The U.S. always leads the world in terms of usage of advanced technologies to increase efficiency and reliability of operations. The industries such as detergents, soaps, personal care, textile, and industrial & institutional cleaning are the major consumers of ethoxylates in US. As a result, the ethoxylates producers are focusing more on such popular ethoxylates application industries. Prevailing ethoxylates manufacturers from North America are exploring the unconventional application such as bio-based ethoxylates in enhanced oil recovery (EOR), the pharmaceuticals industry, and food processing industry. The global ethoxylates market was valued at USD 10.16 Billion in 2015 and is projected to reach USD 12.37 Billion by 2021, at a CAGR of 3.33% from 2016 to 2021. 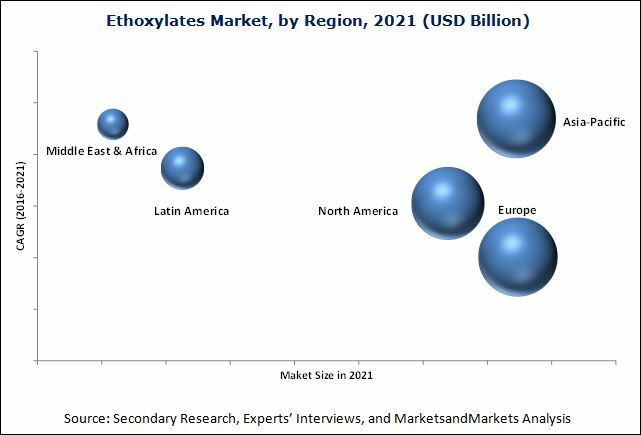 The growing demand from the household & personal care, and pharmaceutical industries, coupled with shift in consumer lifestyles is expected to drive the global ethoxylates market. Alcohol ethoxylates lead the global ethoxylates market in 2015. Alcohol ethoxylates are also expected to witness the highest CAGR from 2016 to 2021 owing to the high demand from North America and Europe, due to the higher environment-friendliness as compared to other ethoxylates. The growing household & personal care, and oilfield industries in the Middle Eastern and Asia-Pacific region countries such as, China, Japan, and India is also driving the alcohol ethoxylates market. The ethoxylates market is classified based on end-use industry into, household & personal care, pharmaceutical, agrochemicals, oilfield, and others. The market is led by the household & personal care end-use industry. Growing disposable incomes, and changing lifestyles of consumers is driving the demand for ethoxylates in the household & personal care industry. Currently, the European region is the largest ethoxylates market, in terms of value, closely followed by the Asia-Pacific region. The Asia-Pacific region is characterized by the technological innovations in the ethoxylates industry and the presence of some of the major players in the region. North America is expected to witness a moderate growth rate. The Asia-Pacific region is expected to be the fastest-growing ethoxylates market, which is backed by the high demand for ethoxylates in the household & personal care, and agrochemicals industries. The demand from major emerging countries such as, China, India, and South Korea also drives the ethoxylates market in the region. The major restraints in the market are, the low potential in developed countries, and environmental concerns regarding the toxicity issues of some ethoxylates. Many countries in Europe and North America have strict government regulations regarding the use of toxic chemicals. Companies are focusing on expansions as a major strategy to strengthen their market positions in the global ethoxylates industry. The development of bio-based, and upgraded & customized products provide high growth opportunities to ethoxylates manufacturers. Some of the important manufacturers are, BASF SE (Germany), Royal Dutch Shell Plc (Netherlands), Huntsman International LLC (U.S.), Stepan Company (U.S.), Clariant AG (Switzerland), The Dow Chemical Company (U.S.), Sasol Ltd (South Africa), India Glycols Ltd. (India), Ineos Group Ltd. (Switzerland), and Solvay (Belgium). Companies in this market compete with each other with respect to prices and product offerings to strengthen their positions. The ethoxylates market is expected to reach USD 12.3 billion by 2021, at a CAGR of 3.33% from 2016 to 2021. Global market growth attributed to growing demand in household & personal care industry, and increasing demand of low-rinse detergents. China is the largest market for ethoxylates in Asia-Pacific due to plenty of raw material suppliers in these countries. Many household & personal care, and agrochemicals companies set up their base in China in the recent years due to availability of cheap labor as well as technology. The next two largest markets – the US and Germany – will also offer significant growth opportunities.